Former atheist Anthony Flew called it “the best attested miracle claim in history”. But can we really believe Jesus was raised from death? Is the evidence strong enough to support this belief? What was actually going on in Jerusalem back then? Jesus was a real person who was executed and buried near Jerusalem about 30 CE. His tomb was later found to be empty and his followers said they had seen him alive. No-one ever produced his body or challenged their claim that the tomb was empty. Belief in the resurrection was a major motivation for the growth of christianity despite persecution. Christians argue that the stories are true because no other hypothesis can satisfactorily explain these facts. The empty tomb is virtually certain. The ‘appearances’ of Jesus to so many people at once, and the physical nature of them (e.g. he ate fish) cannot be explained by hallucinations. Belief in such a resurrection was unknown in Judaism, so they were unlikely to have ever thought of the idea unless it actually happened. The disciples never recanted, and many died for their belief – unlikely if they had made the story up. Sceptics say miracles don’t occur – any other explanation is more believable than resurrection. The gospel stories are confusing and cannot be put together into a consistent account. The gospels were written a generation after the event and we cannot know if they were written by eye-witnesses. The disciples must have been under pressure and seen hallucinations. Or perhaps the story is a much later legend, copying pagan myths about dying and rising gods. Believers have answers for these objections. The idea of copying from pagan myths has been discredited by scholars. Such a miracle is believable if God was revealing himself through Jesus. And the apparent discrepancies in the story are only minor – historians (like police investigators) are comfortable with taking the corroborated evidence and letting go of the rest, and in this case, the main facts are all corroborated. And so the arguments go on. They are examined in more detail in Was Jesus raised from the dead? Can the gospel accounts be reconciled? The facts above are those determined by cautious secular historians. But former Oxford scholar, the late John Wenham, has attempted to go further than the historians often go to harmonise the diverse gospel accounts. 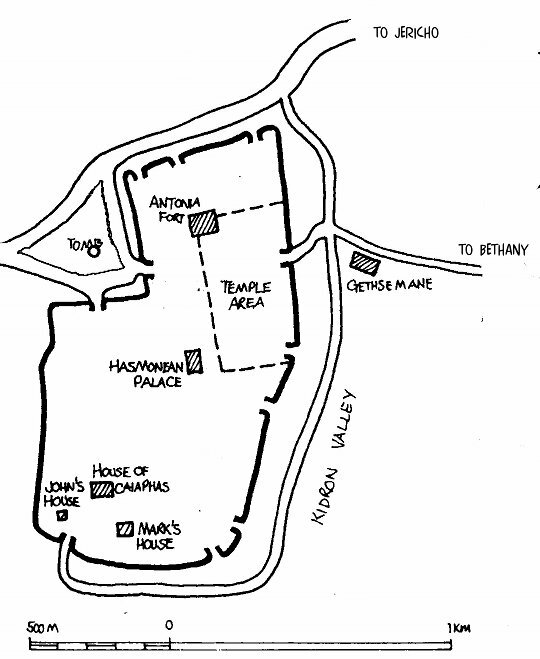 Based on his familiarity with the geography of ancient Jerusalem (as shown in the map), and plausible assumptions about the identification of some of the un-named (or ambiguously identified) characters in the story and of the writers of the gospels, Wenham has woven a narrative that explains all the Easter events and the appearances of Jesus in a logical way. Key to his explanation is his view that each gospel writer portrayed the events from the viewpoint of where he, or his sources, were at any time. So each writer reported the most significant events known to all, but only recorded those appearances and conversations where he or his sources were present – hence the diversity of accounts. His account may or may not be historical fact, but it is a fascinating reconstruction, and shows that the accounts are not necessarily inconsistent. It’s an old book – Easter Enigma by John Wenham – but can be bought online and is highly recommended. So, can we believe in the resurrection? On the basis of the available evidence (and the arguments I’ve seen), I conclude that a rational person may accept or reject the resurrection. That is a very honest and revealing response by a strong and thoughtful atheist. Anyone who believes in Jesus and his God should have no difficulty in accepting that God miraculously raised Jesus. Christians have good evidence for their belief, and the evidence is challenging for non-believers. Read more in Was Jesus raised from the dead?